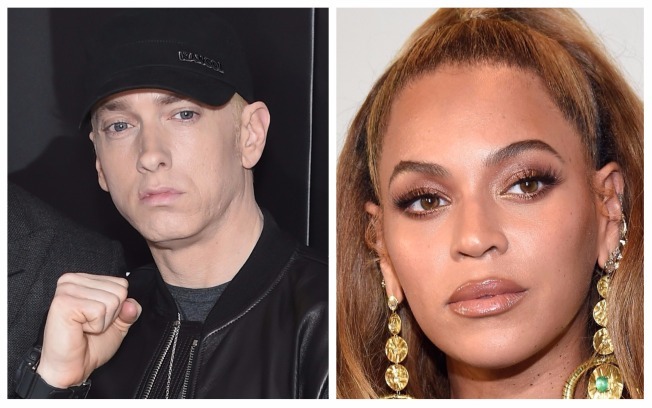 Eminem is back and he’s brought along Queen Bey. On Friday, the rapper released his new single “Walk on Water,” featuring Beyoncé. The track, for his ninth studio album rumored to be called “Revival,” is his first single from an album since 2014’s "Headlights." The song was released on the same day as Taylor Swift's new album, "Reputation." As two of the most successful women working in the music industry today, Beyoncé and Swift have long drawn comparisons. On "Walk on Water," Eminem raps about failing to meet expectations. In October, Eminem released a freestyle at the BET Hip-Hop Awards taking aim at President Donald Trump over his response to the deadly violence at protests in Charlottesville in August and his heavy criticism of NFL players protesting police brutality during the national anthem. Eminem will appear as a musical guest on the Nov. 18 episode of “Saturday Night Live,” hosted by Chance the Rapper.